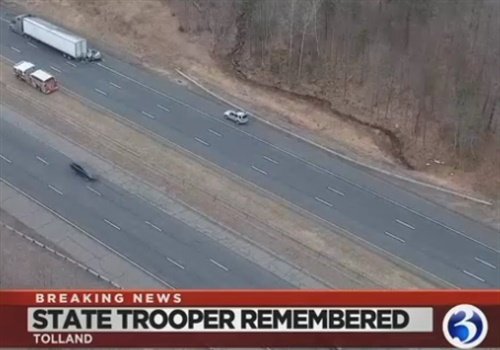 A Connecticut state trooper was killed in a crash that involved his state police cruiser and a tractor-trailer on I-84 east in Tolland around 12:30 p.m. Thursday. Trooper First Class Kevin Miller, of Troop C, was killed in the crash. He was on duty at the time, reports WFSB. State police said he graduated from the Connecticut State Police Academy in 1999. He was previously assigned to Troop K and Troop E.
"We are grateful for his dedicated service to the Connecticut State Police and the residents of Connecticut, and our thoughts and prayers are with his family and friends during this difficult time," State Police said in a press release. There's no word on what caused the crash at this time.